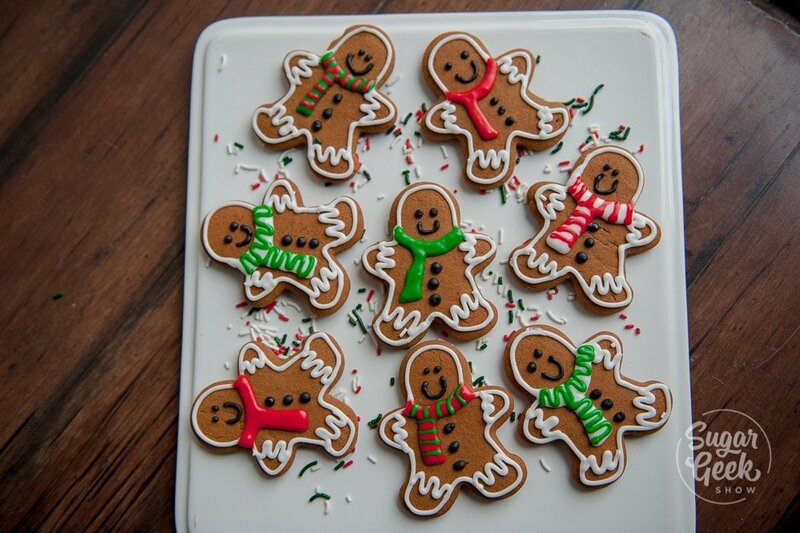 The best gingerbread cookies I have ever eaten. Soft and chewy yet they hold their shape very well while baking. I love baking up a big batch of these for the holidays and letting the kiddos decorate them with royal icing and bowls full of candies. Hello two hours of curling up on the couch with some cocoa and that magazine you’ve been meaning to read while the kids keep themselves busy! 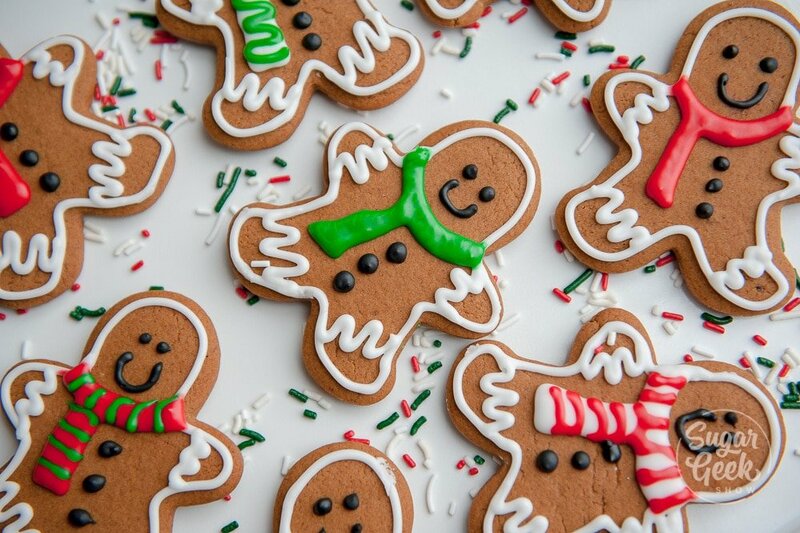 These gingerbread cookies also make excellent gifts. I don’t know about you but I always cringe trying to think up creative gift ideas that are heart-felt but also easy to make. 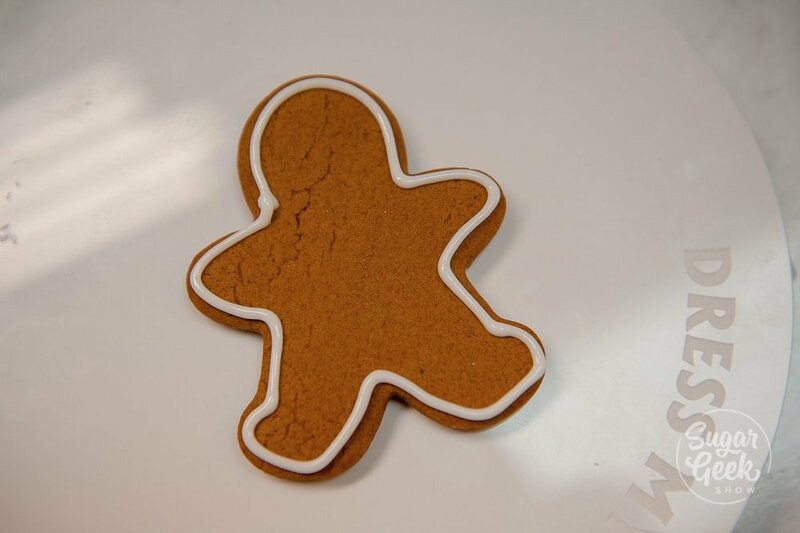 No one says no to a giant gingerbread cookie! So fun to make, decorate and give. Avalon decorated these gingerbread cookies with daddy using the royal icing recipe for piping and flooding. I used to be so intimidated by royal icing consistencies but no more! It’s actually way easier than I ever knew. The most important thing to remember when making gingerbread cookies is to make sure you melt down your butter and combine it with your brown sugar, molasses, salt, and spices. You can do this in the microwave or you can do it on the stovetop if you prefer. This insures that the sugar is completely dissolved and is what get’s you those soft and delicious chewy gingerbread cookies. 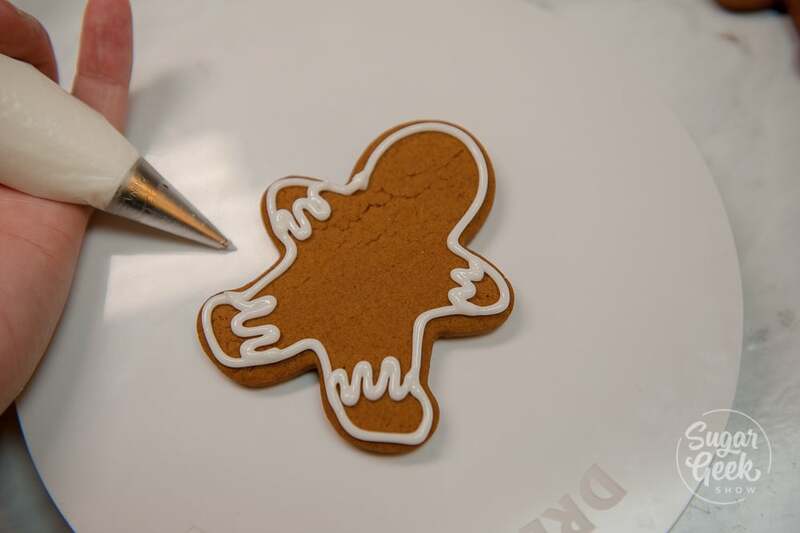 Melting your butter in your gingerbread cookie dough will insure that your cookies are very flat and do not puff up. Sometimes you want your cookies to be very airy and in that case, you should cream your softened butter with the sugar but in this case, we want our cookies to be very very flat with no bubbles. Cool your mixture to room temperature and add in your egg until it’s combined. I usually do this in my stand mixer with the paddle attachment but you could also do it by hand in a bowl with a spoon. Combine together your flour with baking powder and soda and give it a whisk to make sure it’s combined. I prefer to do this instead of sifting because I’m lazy haha. Add your flour into the molasses mixture and mix until a dough forms then stop mixing. The dough is going to be a little sticky and that is normal. Press your dough into a rectangular shape so it’s easier to roll out later. Wrap it in plastic wrap and chill in the fridge for at least one hour but overnight is best. Did you know that the longer you rest your dough (up to 24 hours), the better your cookies will be? They will spread less, more tender to eat and have a more flavorful taste. 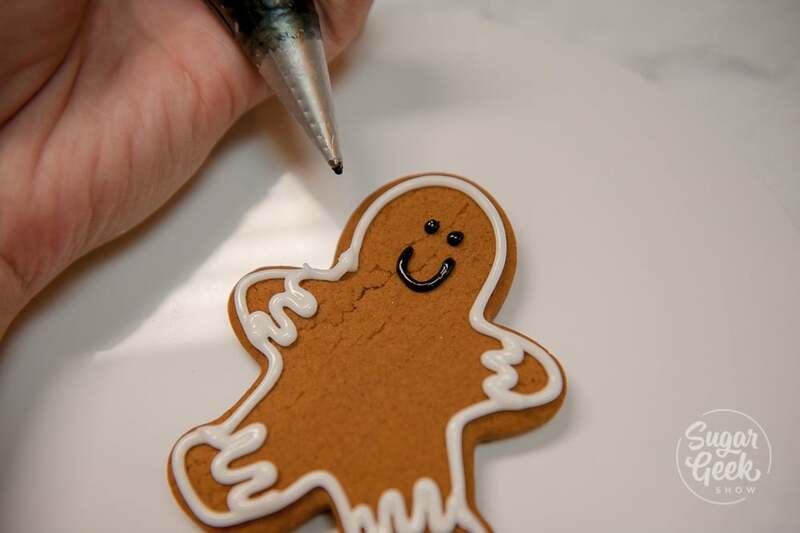 After your dough has been chilled, flour both sides of your dough roll your gingerbread cookie dough out to 1/4″ thick. I like to do this on a silicone baking mat or a piece of parchment paper so that you can easily cut out the cookies on the mat and move them without messing up the shape. Dust your cutters with some flour and cut out your shapes. Try to use as much of your dough as possible with the first cutting but you can re-roll out the leftover dough for more cookies. Place cookies into the freezer for 15 minutes to chill. 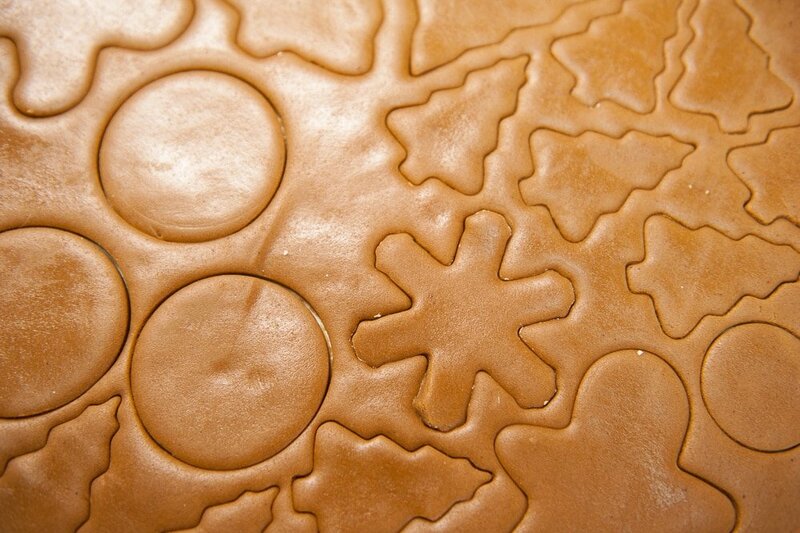 Arrange the cookies onto your cookie sheet lined with a silicone baking mat or parchment and bake for 8-12 minutes. Let your cookies cool completely before moving them or you could crack them. 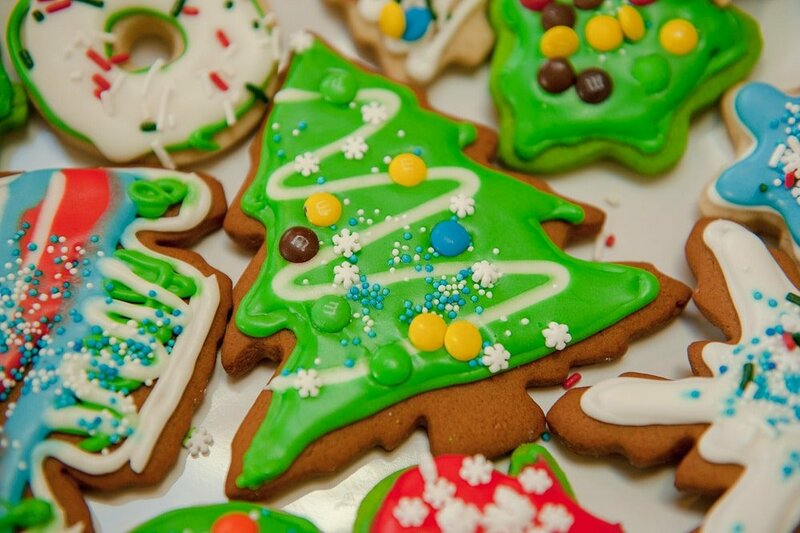 Now your cookies are ready to decorate or wrap up and give as gifts! After my cookies are cooled, it’s time to decorate! I thinned down my royal icing to top coating (15 second icing) so that I could use it for outlining and for flooding (Because I’m lazy). Then I colored some black, green and red for my decorations. I placed my white royal icing into a small piping bag with a #2 round piping tip but you could use a #1 if you want a finer line. I did a simple outline all the way around the cookie to start. Next I give the arms and legs that classic squiggle. I think it’s pants and cuffs to a shirt? I dont’ know but it’s cute haha. Next I pipe on a small smile and two little dots for eyes. 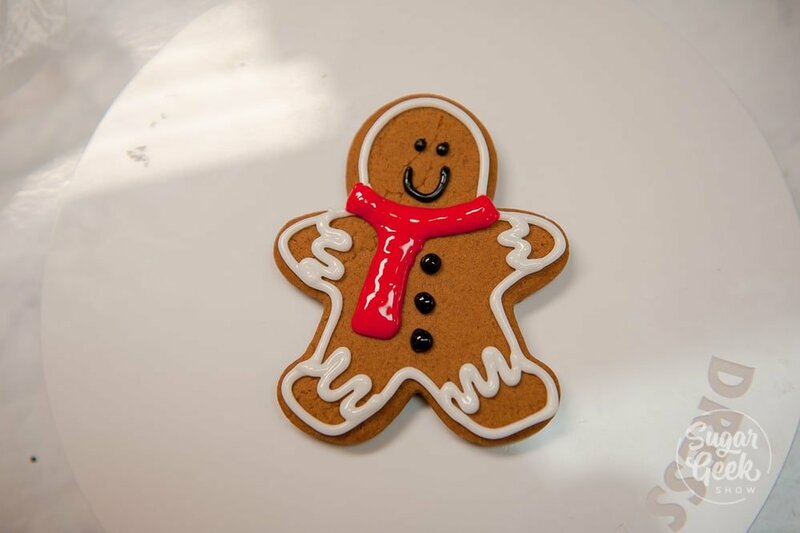 Next I give my little gingerbread man a scarf with the red royal icing. I do an outline first and then I fill it in with the same tip. The last thing I did was added some dots to the front of his body for this “buttons”. He turned out so cute! Trust me, I am not very good with cookies but even I could do this. Mix up the way you make the scarves for a fun cookie platter! Makes a great treat to bring to a holiday party. Did you run out of molasses or can’t find any? 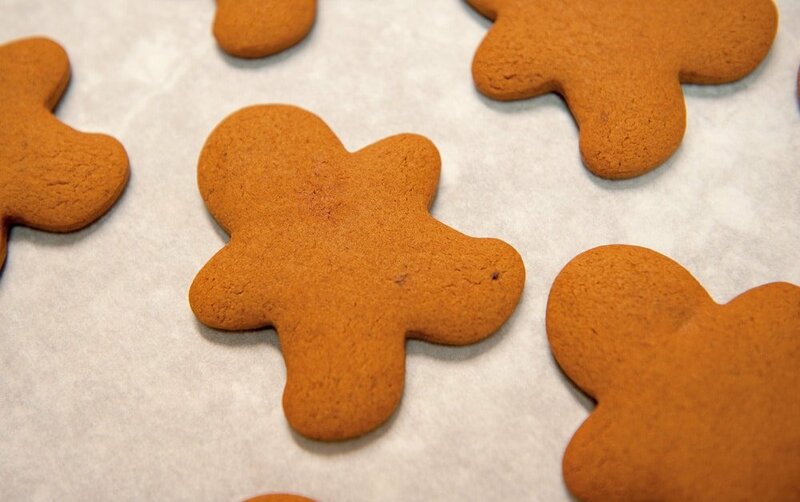 Don’t worry, you can make these gingerbread cookies without molasses pretty easily. Just replace the molasses with dark corn syrup but keep in mind your gingerbread cookies will come out a little bit lighter in color. 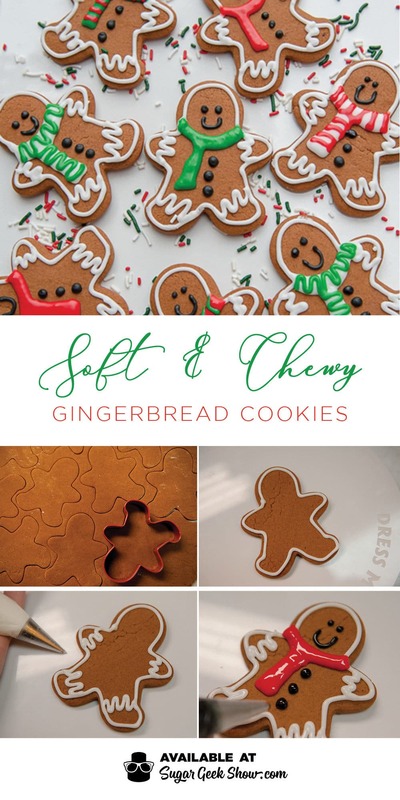 If you loved this gingerbread cookie recipe, you should check out the gingerbread house recipe! So fun to make! The secret to a gingerbread house is a nice strong royal icing and making sure you let the walls dry before you add the roof. 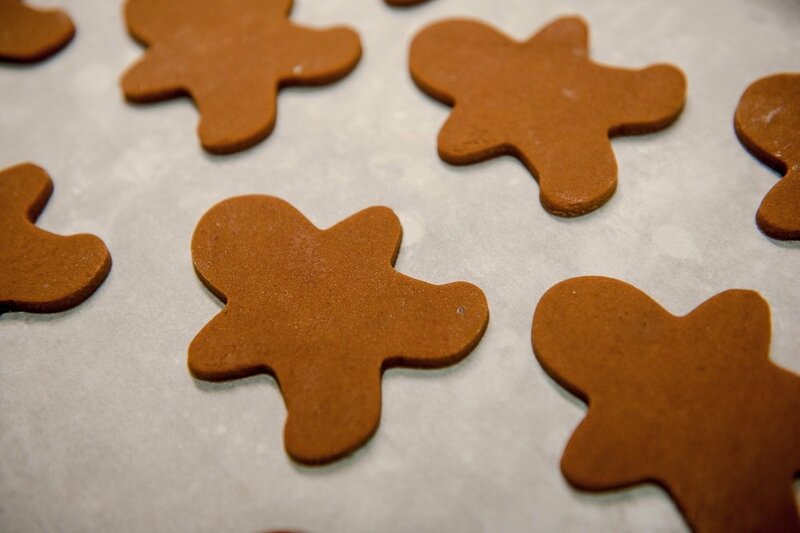 Gingerbread cookies that are soft and chewy and taste amazing thanks to molasses, butter and spices. Great for decorating with royal icing and bringing to your next Holiday party or to give as gifts. Whisk together your flour, baking powder and baking soda. Set aside. Melt butter and add to your stand mixer. On low add in brown sugar, molasses, salt, cinnamon, ginger, nutmeg and cloves and mix until combined, let cool for a few minutes. In the bowl of your stand mixer, once the mixture has cooled to about room temperature, add in the egg and whisk until combined. Switch to your paddle attachment and add in your flour mixture. Mix until your dough starts to form. Dough will still be slightly sticky. Divide dough in half, form into a rectangular shape and wrap tightly with plastic wrap and place in fridge for at least 1 hour. Once the dough has been chilled. Roll out dough to ⅛”-¼” thickness on a clean, floured surface. The thinner you roll your dough, the crisper the cookies will be. If your dough gets sticky, you may need to reflour your dough (both sides) as you go. 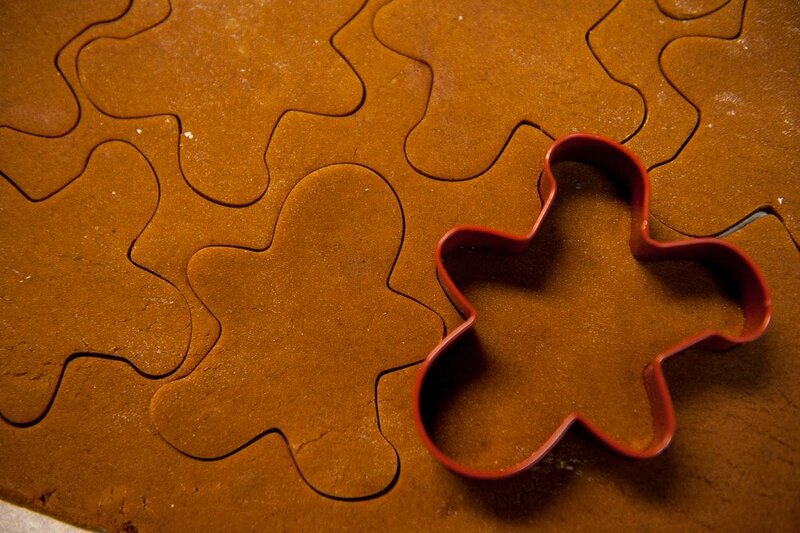 Flour your cookie cutters and cut out all your desired shapes. Bake on a parchment lined cookie sheet for 8-12 min or until the edges are slightly brown. Let cool completely for several minutes before removing from cookie sheet and placing them on a cooling rack to completely set. 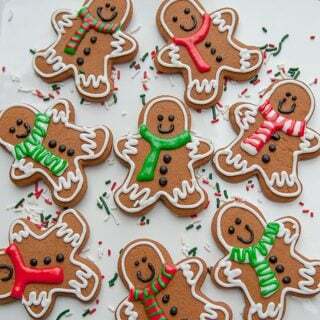 Making gingerbread men cookies can be so fun! 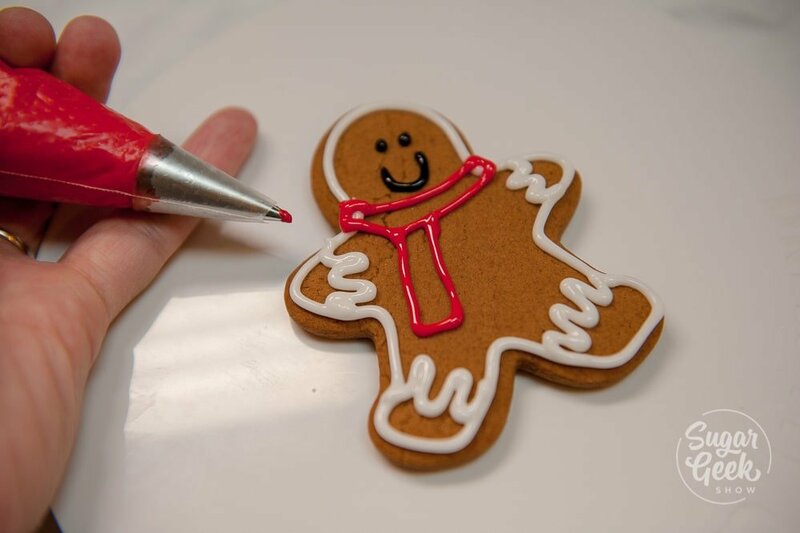 Just make your dough, bake your cookies and then frost details with royal icing! No special piping skills required. I used a piping tip #2 and a piping bag and red, black and green food color gel from americolor. 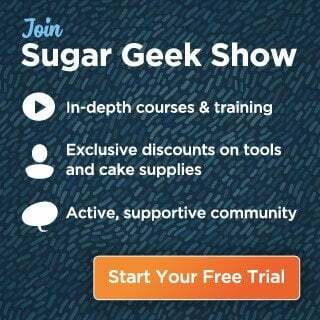 Can I use treacle/light corn syrup instead of molasses/dark corn syrup? We don’t get molasses or dark corn syrup where I live.